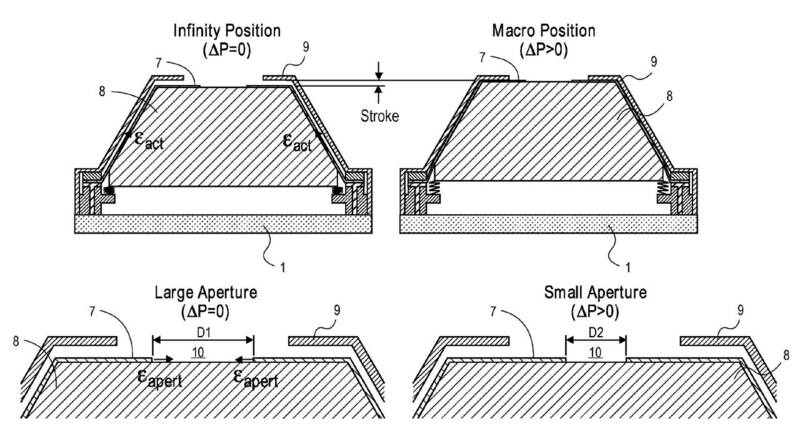 Apple has filed a patent application for using "artificial muscle" technology to focus cameras in devices such as its iPhone and iPad, a tech that could allow for slimmer mobile shiny-shiny. United States Patent Application No. 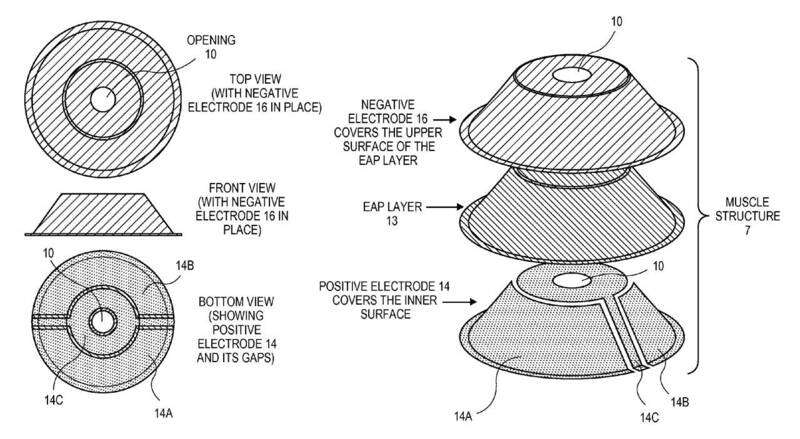 20140168799, entitled – appropriately enough – "Artificial Muscle Camera Lens Actuator", describes a method of creating an artificial muscle structure based on electroactive polymers (EAP) that would replace the comparatively bulky voice coil motor (VCM) tech widely used for mobile-camera focus duties. The application, filed last August and published on Thursday, admits that the idea isn't new. "There have been suggestions to use artificial muscle technology for implementing a camera autofocus lens actuator," it acknowledges. What has changed, the filing says, is that EAP materials can now be "engineered and developed to for high volume manufacture." 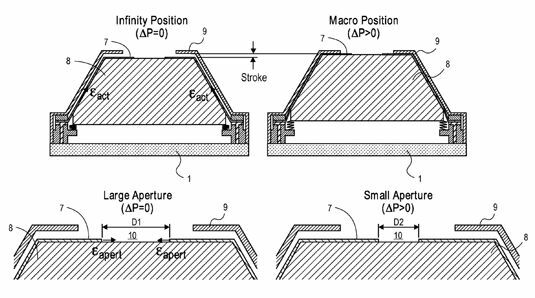 According to Apple, there have been attempts to use EAP to create an autofocus lens, "but a completely engineered solution for high volume manufacture or mass production may not be available." 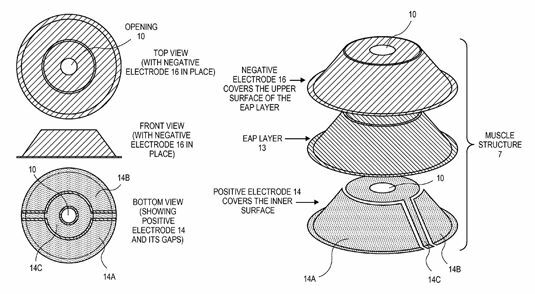 Apple's "completely engineered solution" involves EAP fabricated in a "frusto-conical shape" – a truncated cone – surrounded by a negative electrode on top and a positive electrode beneath. This three-layer construction surrounds a matching frusto-conical lens; the entire construction is encased in a metal frame and supported below by pre-tensioned springs. 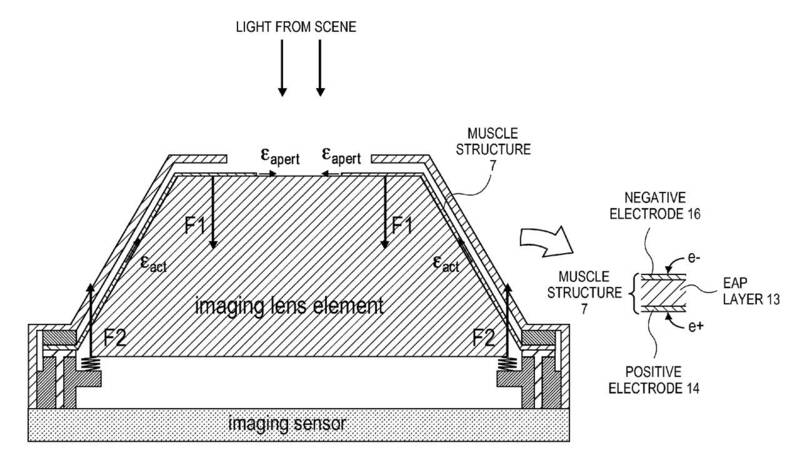 The "artificial muscle" can be stimulated to position the lens-EAP assembly upward or downwards by changing the electrical potential between the negative and positive electrodes, thus changing the focal length of the lens in relation to the camera's image sensor, which is at the base of the metal frame. In addition to this up-down movement of the lens-EAP assembly, an additional circular electrode-EAP assembly sits on top of the frusto-conical lens, with a central hole that acts as the camera's aperture. When the potential of the electrodes sandwiching this assembly changes, the hole can shrink or expand, thus changing the size of the aperture, which changes the camera's f-stop. The advantages of this scheme are threefold, the filing notes. First, there's the possibility of what the filing calls a "significant cost reduction" versus using a voice-coil motor to handle focusing. Second, the assembly has the capability of supporting larger optical elements "due to its generally frusto-conical shape." Third, compared with a voice-coil motor scheme, an EAP-based focusing system "may exhibit extremely low power consumption."